The predicted curve relating one distance indicator to another depends on the cosmological model. The plot of redshift vs distance for Type Ia supernovae shown earlier is really a plot of cz vs DL, since fluxes were used to determine the distances of the supernovae. This data clearly rules out models that do not give a linear cz vs DL relation for small cz. Extension of these observations to more distant supernovae have started to allow us to measure the curvature of the cz vs DL relation, and provide more valuable information about the Universe. For rho less than or equal to the critical density rho(crit), the Universe expands forever, while for rho greater than rho(crit), the Universe will eventually stop expanding and recollapse. The value of rho(crit) for Ho = 65 km/sec/Mpc is 8E-30 = 8*10-30 gm/cc or 5 protons per cubic meter or 1.2E11 = 1.2*1011 solar masses per cubic Megaparsec. The latter can be compared to the observed 1.75E8 = 1.75*108 solar luminosities per Mpc3, requiring a mass-to-light ratio of 700 in solar units to close the Universe. If the density is anywhere close to critical most of the matter must be too dark to be observed. Current density estimates suggest that the matter density is between 0.2 to 1 times the critical density, and this does require that most of the matter in the Universe is dark. One consequence of general relativity is that the curvature of space depends on the ratio of rho to rho(crit). We call this ratio Omega = rho/rho(crit). For Omega less than 1, the Universe has negatively curved or hyperbolic geometry. For Omega = 1, the Universe has Euclidean or flat geometry. For Omega greater than 1, the Universe has positively curved or spherical geometry. We have already seen that the zero density case has hyperbolic geometry, since the cosmic time slices in the special relativistic coordinates were hyperboloids in this model. The figure above shows the three curvature cases plotted along side of the corresponding a(t)'s. These a(t) curves assume that the cosmological constant is zero, which is not the current standard model. Omega > 1 still corresponds to a spherical shape, but could expand forever even though the density is greater than the critical density because of the repulsive gravitational effect of the cosmological constant. If Omegao is greater than 1 the age of the Universe is even smaller than (2/3)/Ho. The figure above shows the scale factor vs time measured from the present for Ho = 65 km/sec/Mpc and for Omegao = 0 (green), Omegao = 1 (black), and Omegao = 2(red). The age of the Universe is 15, 10 and 8.6 Gyr in these three models. The recollapse of the Omegao = 2 model occurs when the Universe is 11 times older than it is now, and all observations indicate Omegao < 2, so we have at least 80 billion more years before any Big Crunch. However, if Omegao is sufficiently greater than 1, the Universe will eventually stop expanding, and then Omega will become infinite. If Omegao is less than 1, the Universe will expand forever and the density goes down faster than the critical density so Omega gets smaller and smaller. Thus Omega = 1 is an unstable stationary point unless the expansion of the universe is accelerating, and it is quite remarkable that Omega is anywhere close to 1 now. The figure above shows a(t) for three models with three different densities at a time 1 nanosecond after the Big Bang. The black curve shows the critical density case with density = 447,225,917,218,507,401,284,016 gm/cc. Adding only 1 gm/cc to this 447 sextillion gm/cc causes the Big Crunch to be right now! Taking away 1 gm/cc gives a model with Omega that is too low for our observations. Thus the density 1 ns after the Big Bang was set to an accuracy of better than 1 part in 447 sextillion. Even earlier it was set to an accuracy better than 1 part in 1059! Since if the density is slightly high, the Universe will die in an early Big Crunch, this is called the "oldness" problem in cosmology. And since the critical density Universe has flat spatial geometry, it is also called the "flatness" problem -- or the "flatness-oldness" problem. Whatever the mechanism for setting the density to equal the critical density, it works extremely well, and it would be a remarkable coincidence if Omegao were close to 1 but not exactly 1. Note that the worldlines for galaxies are now curved due to the force of gravity causing the expansion to decelerate. In fact, each worldline is a constant factor times a(t) which is (t/to)2/3 for this Omegao = 1 model. The red pearshaped object is our past lightcone. While this diagram is drawn from our point-of-view, the Universe is homogeneous so the diagram drawn from the point-of-view of any of the galaxies on the diagram would be identical. an Omegao = 2 model (which really is "round") is plotted this way with a(t) used as the radial coordinate. The past lightcone of an observer reachs halfway around the Universe in this model. The conformal space-time diagram is a good tool use for describing the meaning of CMB anisotropy observations. The Universe was opaque before protons and electrons combined to form hydrogen atoms when the temperature fell to about 3,000 K at a redshift of 1+z = 1090. 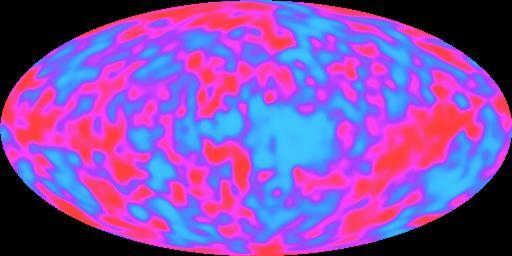 After this time the photons of the CMB have traveled freely through the transparent Universe we see today. Thus the temperature of the CMB at a given spot on the sky had to be determined by the time the hydrogen atoms formed, usually called "recombination" even though it was the first time so "combination" would be a better name. Since the wavelengths in the CMB scale the same way that intergalaxy distances do during the expansion of the Universe, we know that a(t) had to be 0.0009 at recombination. For the Omegao = 1 model this implies that t/to = 0.00003 so for to about 14 Gyr the time is about 380,000 years after the Big Bang. This is such a small fraction of the current age that the "stretching" of the time axis when making a conformal space-time diagram is very useful to magnify this part of the history of the Universe. The space-time diagram above shows virtual particle-antiparticle pairs forming out of nothing and then annihilating back into nothing. For particles of mass m, one expects about one virtual particle in each cubical volume with sides given by the Compton wavelength of the particle, h/mc, where h is Planck's constant. Thus the expected density of the vacuum is rho = m4*c3/h3 which is rather large. For the largest elementary particle mass usually considered, the Planck mass M defined by 2*pi*G*M2 = h*c, this density is 2E91 gm/cc. Thus the vacuum energy density is at least 121 orders of magnitude smaller than the naive quantum estimate, so there must be a very effective suppression mechanism at work. If a small residual vacuum energy density exists now, it leads to a "cosmological constant" which is one proposed mechanism to relieve the tight squeeze between the Omegao=1 model age of the Universe, to = (2/3)/Ho = 10 Gyr, and the apparent age of the oldest globular clusters, 16+/-4 Gyr. The vacuum energy density can do this because it produces a "repulsive gravity" that causes the expansion of the Universe to accelerate instead of decelerate, and this increases to for a given Ho. The inflationary scenario proposes that the vacuum energy was very large during a brief period early in the history of the Universe. When the Universe is dominated by a vacuum energy density the scale factor grows exponentially, a(t) = exp(H(to-t)). The Hubble constant really is constant during this epoch so it doesn't need the "naught". If the inflationary epoch lasts long enough the exponential function gets very large. This makes a(t) very large, and thus makes the radius of curvature of the Universe very large. The diagram below shows our horizon superimposed on a very large radius sphere on top, or a smaller sphere on the bottom. Since we can only see as far as our horizon, for the inflationary case on top the large radius sphere looks almost flat to us. This solves the flatness-oldness problem as long as the exponential growth during the inflationary epoch continues for at least 100 doublings. Inflation also solves the horizon problem, because the future lightcone of an event that happens before inflation is expanded to a huge region by the growth during inflation. This space-time diagram shows the inflationary epoch tinted green, and the future lightcones of two events in red. The early event has a future lightcone that covers a huge area, that can easily encompass all of our horizon. Thus we can explain why the temperature of the microwave background is so uniform across the sky. The map above shows cosmic anisotropy (and detector noise) after the dipole pattern and the radiation from the Milky Way have been subtracted out. The anisotropy in this map has an RMS value of 30 microK, and if it is converted into a gravitational potential using Sachs and Wolfe's result and that potential is then expressed as a height assuming a constant acceleration of gravity equal to the gravity on the Earth, we get a height of twice the distance from the Earth to the Sun. The "mountains and valleys" of the Universe are really quite large. Inflation predicts a certain statistical pattern in the anisotropy. The quantum fluctuations normally affect very small regions of space, but the huge exponential expansion during the inflationary epoch makes these tiny regions observable. The space-time diagram on the left above shows the future lightcones of quantum fluctuation events. The top of this diagram is really a volume which intersects our past lightcone making the sky. The future lightcones of events become circles on the sky. Events early in the inflationary epoch make large circles on the sky, as shown in the bottom map on the right. Later events make smaller circles as shown in the middle map, but there are more of them so the sky coverage is the same as before. Even later events make many small circles which again give the same sky coverage as seen on the top map. An animated GIF file showing the spatial part of the above space-time diagram as a function of time is available here [1.2 MB]. The pattern formed by adding all of the effects from events of all ages is known as "equal power on all scales", and it agrees with the COBE data. Having found that the observed pattern of anisotropy is consistent with inflation, we can also ask whether the amplitude implies gravitational forces large enough to produce the observed clustering of galaxies. The conformal space-time diagram above shows the phi(x) at recombination determined by COBE's dT data, and the worldlines of galaxies which are perturbed by the gravitational forces produced by the gradient of the potential. Matter flows "downhill" away from peaks of the potential (red spots on the COBE map), producing voids in the current distribution of galaxies, while valleys in the potential (blue spots) are where the clusters of galaxies form. COBE was not able to see spots as small as clusters or even superclusters of galaxies, but if we use "equal power on all scales" to extrapolate the COBE data to smaller scales, we find that the gravitational forces are large enough to produce the observed clustering, but only if these forces are not opposed by other forces. If the all the matter in the Universe is made out of the ordinary chemical elements, then there was a very effective opposing force before recombination, because the free electrons which are now bound into atoms were very effective at scattering the photons of the cosmic background. We can therefore conclude that most of the matter in the Universe is "dark matter" that does not emit, absorb or scatter light. Furthermore, observations of distant supernovae have shown that most of the energy density of the Universe is a vacuum energy density (a "dark energy") like Einstein's cosmological constant that causes an accelerating expansion of the Universe. These strange conclusions have been greatly strengthened by temperature anisotropy data at smaller angular scales which was be provided by the Wilkinson Microwave Anisotropy Probe (WMAP) in 2003.